Our nationally renowned Purim Spiel has received accolades from the New York Times, and packs the seats of our congregation each year. 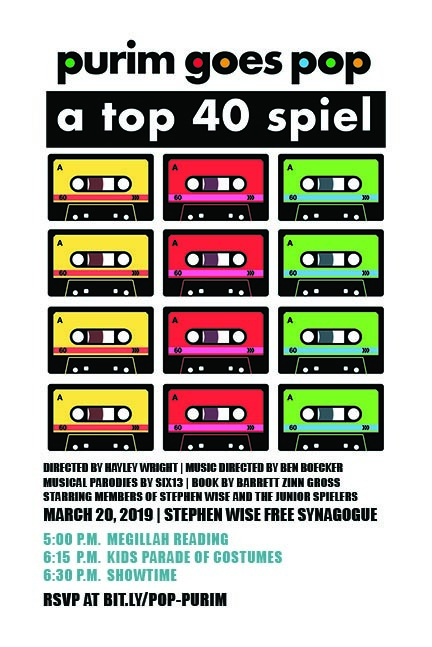 This year's pop-musical play: "Purim Goes Pop: A Top 40 Spiel"
Or check out our other Purim programming here. For more than 30 years, the annual purim spiel has been one of Stephen Wise Free Synagogue's most popular traditions. It features congregants of all ages and levels of talent. Maybe you have questions, or want to help out behind the scenes? Email or call Rabbi Samantha Natov at 212-877-4050, ext. 244. For 29 years, the spiel was written and directed by congregant Norman Roth (see him profiled in The New York Times here).